TFR’s writers look at moments that changed film history. 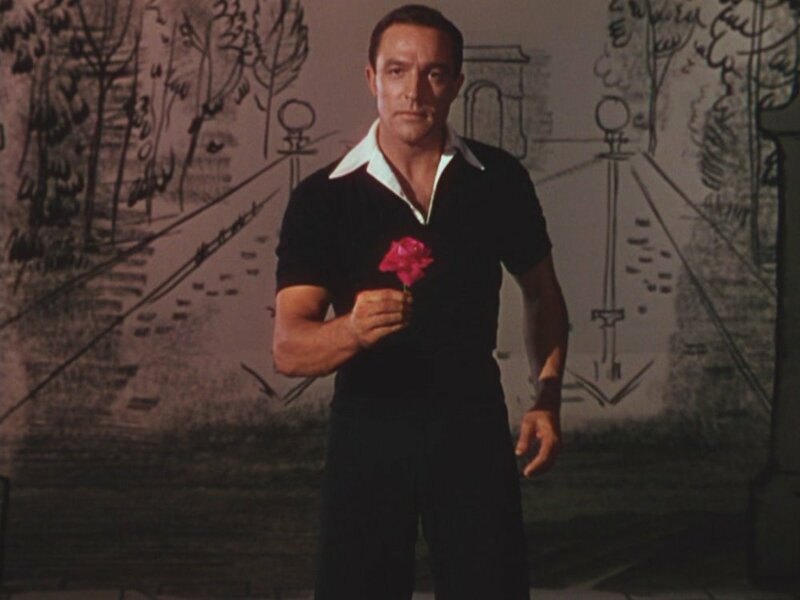 Gene Kelly is a controversial character among fans of classic Hollywood musicals. The Kelly versus Astaire debacle is one that can be likened to the Lyon’s versus Barry’s debate in both the importance of content and the passionate stance of each side. Regardless of what side you fall down on it is an undeniable fact the the technical innovations Gene Kelly brought to his films revolutionised the ways in which musicals were made and consumed. The technical and ideological fantasies presented in Kelly’s musicals are inherently revolutionary because they ask you to imagine another reality, a reality of limitless imagination and, of course, dance. Kelly’s innovations begin at a relatively small scale and gradually expand until we reach the jaw-dropping new heights of Kelly’s genre redefining “The American in Paris Ballet” in Vincente Minnelli’s 1951 masterpiece. In the seventeen minute long ballet sequence Kelly and his massive ensemble retell the narrative through ballet as they dance through sets of the recreated paintings of Renoir, Rousseau and Toulouse-Lautrec among others. This sequence was an unheard endeavour in the supposedly lowbrow movie musical form. Kelly succeeded in reconfiguring the critical understanding of an entire genre. As early as his fourth feature film, Kelly began taking the creative reigns to allow his dances to reach new heights. In Cover Girl Kelly orchestrated a dance number with his own reflection. In Anchors Aweigh he combined live-action and animation entering a cartoon world and dancing with Jerry Mouse (of Tom and Jerry). Kelly can be considered a natural successor to Busby Berkeley in his true recognition of the possibilities posed in marrying cinema and dance, the possibility for dance to be experienced in a way that is impossible live, a true reinvigoration of the art form. In the science fiction genre, no film has been as innovative and revolutionary as Stanley Kubrick’s magnum opus, 2001: A Space Odyssey (1968). One of the main reasons it is a “game changer” is its commitment to accuracy. With the US and the USSR in the middle of the Space Race, spacecraft and equipment were constantly evolving. Kubrick, who was known for his excruciatingly close attention to detail, hired several astronomical artists and aeronautic experts in order to ensure that the mise-en-scène of spaceship Discovery One was as accurate and as up-to-date as possible.This commitment made 2001 one of the most faultless representations of space flight. There was also a huge commitment to the special effects, including the 30-ton rotating wheel set to create the look of centripetal motion and zero-gravity of the Discovery One spacecraft, and the use of the revolutionary slit scan photography created by Douglas Trumbull to create the “Star Gate” sequence. This dedication to aesthetic accuracy and stunning visuals sets 2001 apart from other science fiction films of the 1960s such as Barbarella and Planet of the Apes. With its stunning visuals of space set to the music of Johann Strauss II and Gyorgy Ligeti, this film is not just a science fiction classic, it is a great artistic achievement that will continue to amaze for generations to come. Hollywood titles reign supreme in the category of films that revolutionised cinema. From Citizen Kane to Psycho to Jurassic Park, American influence seems to dominate. When venturing beyond the realm of the multiplex and into the art-house, Das Cabinet des Dr. Caligari, Ladri di Biciclette and Les 400 Coups are cited as revolutionary products of the European market. These films hold equal weight in cinematic history but art-house connotations consign them to niche existence. In 2001, Amélie revolutionised cinema by bridging the ever-expanding gap between cinematic influences. The French film, with its exaggeratedly whimsical narrative, set against a backdrop of dazzling visuals, received international acclaim. Not since La Cage aux Folles, released twenty-three years prior, had a French-language film been welcomed into global consciousness with such enthusiasm. Amélie continues to stand the test of time, achieving a fate often elusive to the foreign film: passage into popular culture. At its core, Amélie is a love story set in Paris. Though a far cry from unconventionality, its treatment of the subject matter renders the film unique. Character eccentricities, existentialism and poeticism are afforded the same narrative importance as romance, rather than function exclusively as subtexts thereof. The revolutionary success of Amélie illustrated the capacity of foreign-language film to break into the American market in a twenty-first century context, even when times were hard for dreamers. Tangibility, reciprocity, identity, ephemerality, romance and dissolution. All this and more comes to mind during a profound scene in Blade Runner 2049, when the hologram Joi (Ana de Armas) maps herself over the body of the pleasure unit Mariette (Mackenzie Davis) so that she may physically interact with the replicant K (Ryan Gosling). Not only is the moment a visual masterpiece and a cinematic marvel, but it is charged with such philosophical complexity and nuance that, coupled with the delicate piano composition by Hans Zimmer and Benjamin Wallfisch, lifts the viewer from their own sense of self. The existential and socio-political implications are limitless. Denis Villeneuve masterfully shifts from the film’s tense narrative to this aching moment. The soft lighting, the gray walls of the apartment, the feint neon glows shimmering against the window, all these contribute to a crushing melancholy that washes over the viewer. The sorrow of a faded identity that wants nothing more than to have its existence confirmed, and loved. As Joi overlaps with Mariette, we see our own reflection in their duality and, for just a few tenuous seconds, we experience ourselves as holograms. Joi’s words resonate: “I want to be real for you”.